The 5000 year old village of Barnhouse in Orkney, is one of the finest examples of neolithic settlement in the UK. Situated on the shore of Loch Harray, archaeological excavations in the 1980’s discovered a settlement of six small houses and a two larger buildings in an area already rich in historic monuments. Barnhouse settlement was built around 3,040BC and the size of a couple of the structures, together with archaeological finds, changed that way historians thought of life in this period. The buildings were constructed of local stone with turf roofs. It is thought that stacked turf walls inside would have provided insulation. Two of the buildings found at Barnhouse are very unusual in their size and exceptional high quality of construction. Building 8, is the largest known covered space in neolithic Orkney with an entrance that seemed to suggest walking over a symbolic fire pit. A complete grooved ware vessel was found set into the floor and 14 prepared flint nodules were buried in a pit. Flint was a scare material at this time and such a hoard was likely to have been valuable. Building 2 is also quite substantial. Much more prominent than the other buildings and separated into two rooms. Two chambers are situated one behind the other round a central hearth. The stonework of this building is thought to be very similar to the surrounding tombs and burial cists in the area, suggesting possible ceremonial use. Discovery of two unfinished mace heads and burial of a polished stone chisel also suggests manufacture of ceremonial objects. The two separate compartments of building 2 each have their own hearth. Appearances suggest that a great deal of cooking was carried out at the eastern end. The stone slab next to the fireplace covered a cist or pit, thought to have contained human bones. For one hour on midwinter morning, a beam of sunlight enters the doorway and illuminates the cist cover. Partial reconstruction of the buildings was carried out after the 1980’s excavations and geophysical surveys around the area indicate that more of the village extends towards the Maes Howe chambered tomb. Burnt remains found at the Barnhouse site, suggest that the villagers had more sheep than cattle and grew a little barley. A number of pieces of Arran Pitchstone and imported flint would indicate that the inhabitants of Barnhouse had trade links with communities on the west coast of Scotland. 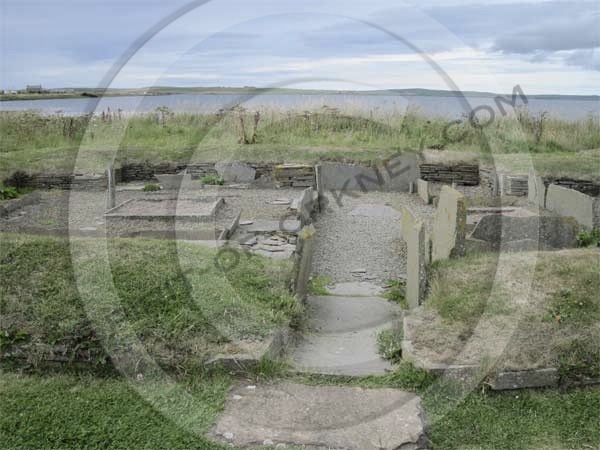 As can be seen from the Scottish History interpretation panel, the site at Barnhouse is quite extensive and although today, we see the monuments and villages of neolithic Orkney standing near each other, it is important to remember that each had its own place and uses in history. Barnhouse lies in the midst of a landscape dominated by monuments such as the Maes Howe chambered cairn, Standing stones of Stennes, Ring of Brodgar and Ring of Bookan. Associated with these monuments are a series of massive standing stones and chambered tombs. Although similar complexes are known elsewhere in Britain and Ireland, only in Orkney have contemporary stone settlements been discovered in close proximity. 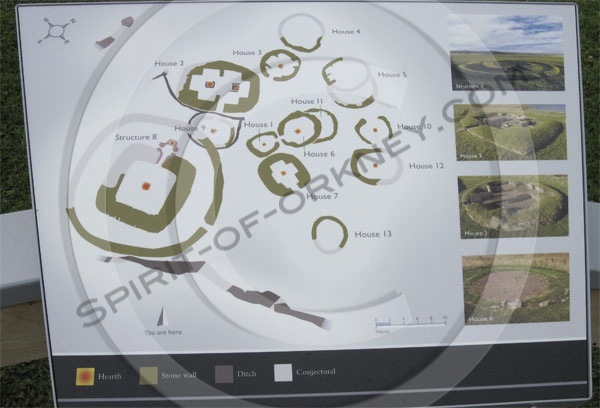 Orkneyjar – To discover more about Barnhouse and Orkney’s neolithic past. 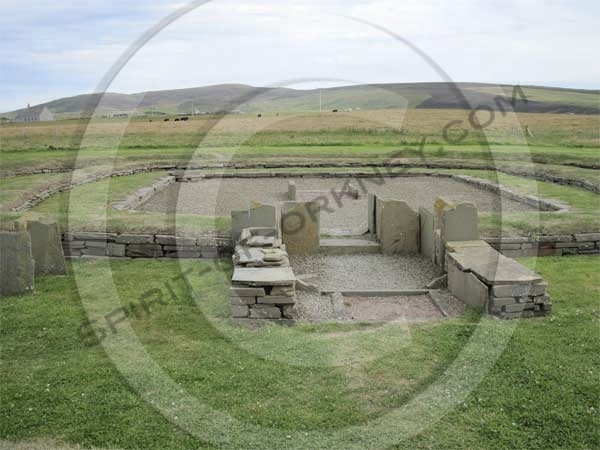 Ancient Scotland – Information and images from the Barnhouse settlement. 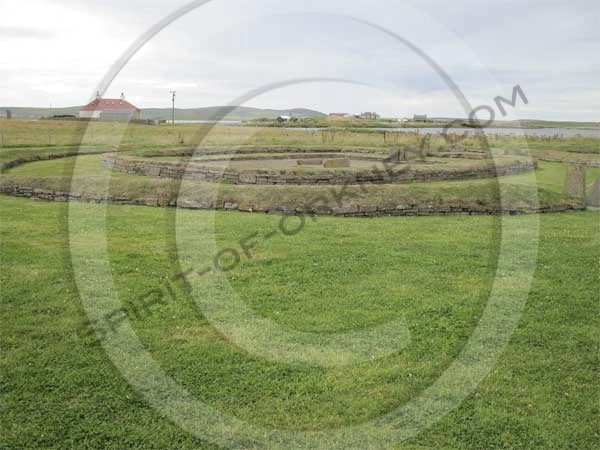 Visit Orkney – Places of interest on the west mainland of Orkney.